Sound waves may not be visible to the naked eye, but they can certainly be felt. In recent times, scientists have been experimenting with using sound waves to levitate objects. But predating those experiments is an object called a Rubens’ Tube, a physics apparatus that shows how sound waves and sound pressure interact. Shown at top, the Rubens’ Tube is a tube with holes drilled along its side. One end is capped and fitted with a propane supply, and the other end is plugged with a small speaker. When the propane is lit and the speaker is turned on, varying amounts of pressure are released from the holes. The flames, then, display differing heights based on the internal sound pressure. 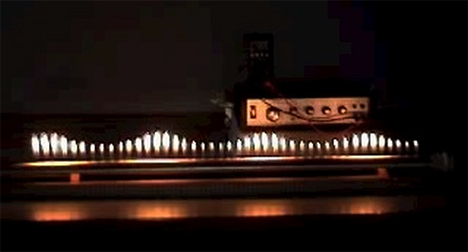 The science video blog Veritasium recreated the Rubens’ Tube in the form of a “Pyro Board,” a flat plane that uses the same principles as the Rubens’ Tube. 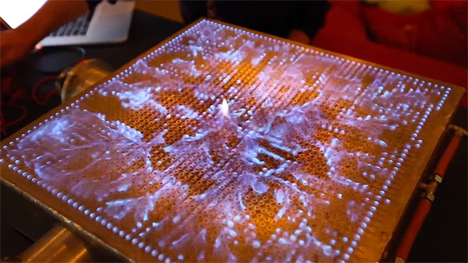 It is a two-dimensional plate with 2,500 holes through which flames erupt, changing height based on the flow of gas which is affected by the volume of the music. 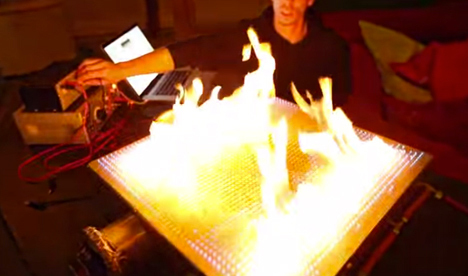 The above video from Veritasium shows the impressive Pyro Board in action. See more in Weird Science or under Science. April, 2014.